Maintaining its long-held commitment to continuing education, H.J. Martin and Son hosted a small group of industry professionals at its Neenah, Wis., location the morning of Oct. 28, 2015. 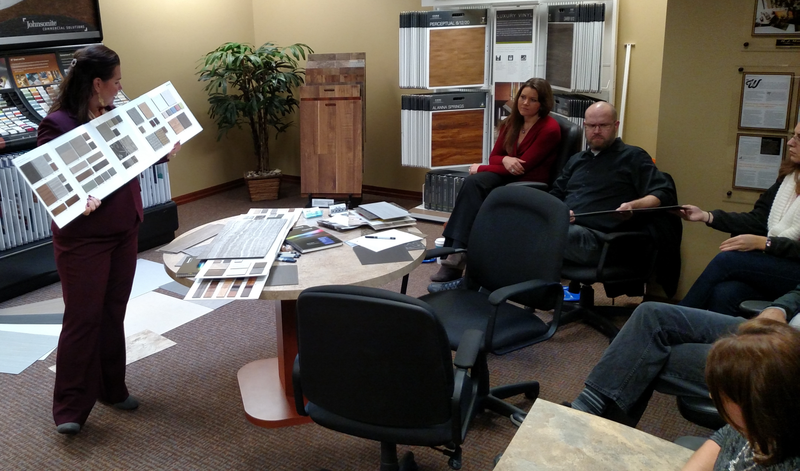 The half-day course, Resilient Flooring Options for the Specifier, brought together architects, interior designers and facility managers from the Fox Valley. A similar session was held at H.J. Martin’s Green Bay location that afternoon. Shelly Davis of Armstrong World Industries covered several topics related to resilient flooring. These included its history and the early use of linoleum, to current uses and new offerings. She also touched on commercial resilient flooring options of homogeneous sheet vinyl, the range of heterogeneous visuals and the most popular pick, luxury vinyl tile (solid vinyl tile), aka LVT. Davis also discussed the multiple applications of each resilient flooring choice, using physical samples, and talked about the maintenance requirements. “We really believe in the value of ongoing education,” says David Martin, Fourth Generation at H.J. Martin, “both for our staff and for our partners in the construction industry. We want to be on top of the continuing advancements in flooring to best serve our customers, beginning with the initial selection. Armstrong World Industries is a global leader in the design and manufacture of floors and ceiling systems. As of March 2015, Armstrong operated 32 plants in nine countries, employing approximately 7,500.